No visit to California's wine country is complete without wine... and delicious food. The pace in the region is a little slower in January, which makes it a great time to beat the crowds to explore all the culinary delights Napa, Sonoma, and other areas have to offer. As the newest resort in Napa Valley, Vista Collina offers guests a fresh retreat among premier vineyards with amenties including world-class accommodations, an on-site vineyard, fantastic culinary options (including a Foley Food & Wine Society tasting room! ), and a variety of experiences for guests to add to their itinerary to make the stay memorable. 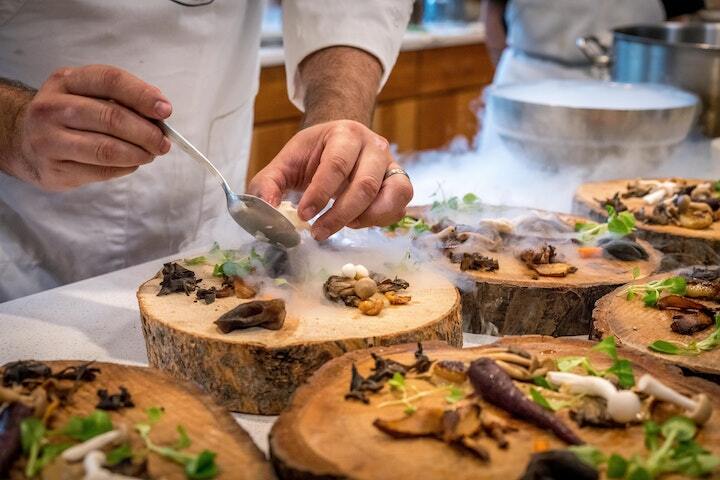 One of these is "The Future of Cooking Dinner," an event hosted by acclaimed Chef Philip Tessier on January 12th where attendees are treated to an elegant reception and four-course tasting menu along with wine pairings and dmonstration of an app-guided cooking system. Tickets can be purchased here. As part of California's Restaurant Month, chefs and establishments across Geyserville will be hosting guests for "Taste Geyserville" from January 11th - 20th; a week to showcase the best culinary delights the town has to offer, including special pairings that can only be found in locally. Some locations will feature special dishes, and others an entire menu made with local ingredients, and paired with local wines that send the taste experience over the top. Participating businesses include Catelli's, Diavola Pizzeria Salumeria, Rustic, and others. The Epicurean Connection presents hands-on cheesemaking classes with their award-winning cheesemaking team, led by acclaimed Sheana Davis. Classes are held on the second Sunday of each month at Sonoma Community Center and give attendees an opportunity to learn how to craft a fresh, warm ricotta cheese that's ready to serve and enjoy within 90 minutes. Check out the current schedule and buy tickets soon - these spots fill up quickly! Join Francis Ford Coppola Winery every Tuesday evening for A Tavola! Meaning “to the table,” a tavola (pronounced “a TAH-voh-lah”) is a casual dining experience inspired by Francis’s favorite way of enjoying a meal. Instead of ordering from menus, the chef prepares a variety of dishes and sends them to your table. It’s great way to enjoy a meal and a lot of fun for the whole family. Take a look at the dates in January and bring the family - all ages welcome! Big Bottom Market is a "lumberjack chic" establishment known for their incredible biscuits (even Oprah loves them - they were included on her annual "Oprah's Favorite Things" list in 2016!) and great sense of community. Once a week, they open their doors for "Community Dinner," using local ingredients to offer one entree for a meal that all can enjoy. Add a glass of wine for just $5 and there's no better place to meet new people and have a great meal. Each Wednesday night throughout the winter, guests are invited to the hip Suite D, owned by the same team from the popular The Girl & The Fig restaurant, to enjoy some delicious ramen. If you haven't heard about the ramen craze that is sweeping the country, don't be confused - we're not talking about the cheap packets of dried noodles that you ate in college. This dish is warm, hearty, and perfect with a glass of wine. More information about Suite D and their events can be found here.